Note: I wrote this back in 2002, for one of my columns in Bird Watcher’s Digest. Unfortunately it’s still relevant today, a full 15 years later, as the Arctic Refuge is once again under attack. As I write this, there is debate as to whether we should drill for oil in the Arctic National Wildlife Refuge in far northern Alaska. Now, don’t get me wrong: I’m convinced there are good and decent people on both sides of the debate. I’m not anti-oil. I drive a car that burns gasoline, albeit not in very large amounts. I have friends who work for oil companies, and these are honest individuals with a professional and personal commitment to wildlife conservation. I believe the debate could be carried on with honesty and integrity. But I also believe that neither side should twist the facts to bolster their arguments. And there’s one huge falsehood I’ve heard too many times. The lie fostered by pro-drilling elements is the idea that the coastal tundra—the area of the refuge where drilling would take place—is essentially worthless. It’s late evening but the sun is still high in the sky, and it will not set any time this month. We’re standing on a rise near a tundra pool, with reflections of evening light in the cold clear water, but our attention has been caught by a bird flying in wide circles overhead. Trim and streamlined, the bird moves with oddly slow and exaggerated wingbeats, as if it has far more power than it needs to stay aloft. Its flight is punctuated with a wild rich whistle that echoes across the tundra. We watch for a minute or more, and then the bird swoops down to land nearby. ​The sky is alive with birdsong. ​It’s a male American Golden-Plover. He stands poised, elegant, a study in crisp pattern, black with white trim below, spangled with gold above. This bird is a powerful flier indeed. When he left here at the end of last summer he would have flown thousands of miles to the east and south, perhaps touching down in eastern Canada or New England, then arrowing south across a wide expanse of the Atlantic to the northern coast of South America, continuing on to the pampas of Argentina. Then, two or three months ago, he would have left that southern outpost to come back, flying on swift strong wings across the Amazon Basin, across the Caribbean, and up through the corridor of the Great Plains, traveling thousands of miles to stake his claim to this patch of supposedly worthless frozen tundra. Maybe this golden-plover already has a mate, hiding somewhere among the matted tundra plants. But even if not, he is not alone: Other birds are all around us. The ridge where we stand is only a few feet higher than the surrounding country, but from here the land stretches out for miles to the flat horizon under a wide pale sky. The land is covered with tussocks of grass, clumps of reindeer moss, boggy low spots, the occasional snowdrift, but broken everywhere by innumerable little ponds. There’s not a tree in sight. Birds that want to sing from elevated positions must take wing, and they have: The sky is alive with birdsong. On the other side of the nearby pond, a small bird is fluttering high. Slim, long-winged, patterned in subtle browns, the bird hovers with odd slow wingbeats, singing a short trilled song that it repeats over and over, on and on. The endurance in this song-flight seems incredible ... but then again, perhaps not. This is another champion flyer, a Baird’s Sandpiper. He spent the winter far south of the equator, perhaps around lakes of the high Andes in Bolivia or Chile. Like the American Golden-Plover, he flew thousands of miles to be here. Other long-distance migrants add to the chorus. The Pectoral Sandpipers—what odd birds they are, or at least the males are odd, as they gather on nearby to outdo each other in courtship displays. One of the males will puff out his chest unbelievably with air, the feathers bristling out so that he looks like a cross between a balloon and a porcupine. He takes off and flies in a circle, giving a series of low booming hoots and sounding like anything in the world but a sandpiper. Odd indeed—although, if female Pectoral Sandpipers are attracted by this, they must be rather strange themselves. These birds have flown back here from as far away as Australia or South America to take part in this annual mating ritual. There are other sandpipers and plovers here as well. 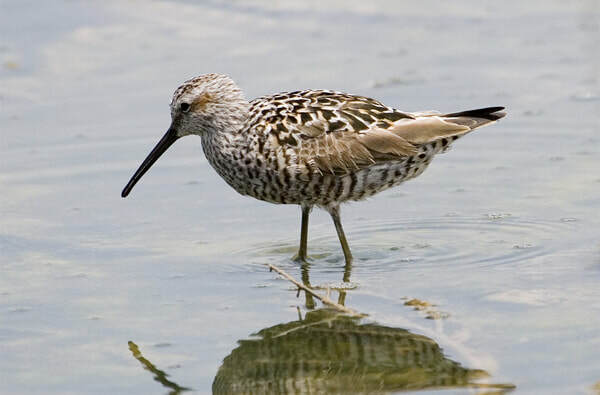 Though we call them shorebirds, most of them are really tundra birds in summer. A White-rumped Sandpiper, another small species, flutters and glides overhead while he makes odd honking and rattling sounds. Not very musical but definitely champion migrants, White-rumps concentrate in southernmost South America in winter, with many in Tierra del Fuego, and they have even been seen in Antarctica. ​Stilt Sandpipers, bigger birds but not quite so ambitious in their migrations, are doing flight displays off in the distance, repeating a guttural song as they glide down on set wings. There are also Buff-breasted Sandpipers, beautiful with their soft colors, standing about on the tundra. They do their displaying mostly from the ground, the males quietly stretching out one wing and then the other to show off the white underwing. High above all the other birds, Wilson’s Snipes are zooming about, making their hollow winnowing sound. The tundra in summer is at least half water, so it’s no surprise that ducks are everywhere. Pintails and Green-winged Teal are on all the small ponds, just as they could be in the Dakotas, but the stars are true Arctic species like eiders and Long-tailed Ducks. Here and there we’ll find a small group of King Eiders resting on a pond. The males are unbelievably ornate, with their orange bill-knobs contrasting with the pale powder blue of their heads. Along the coast itself we might see the eiders passing in flock after flock. Eiders of three or four species, big hardy sea-ducks of cold waters, stick to the Arctic Ocean as long as they can before peeling off inland to their nesting grounds. Many of these eiders (and their cousins, the Long-tailed Ducks) will have spent the winter in open leads of the shifting pack ice, as far north as the Arctic Circle. Now they cross paths with flocks of Brant, small sea-going geese that may have wintered along the west coast of Mexico, or with Red-throated Loons that have come from the California coast. A year’s worth of living is crowded into a few weeks, and the skies ring with the cries of birds that have traveled thousands of miles to be here. ​But there are other birds here whose wintering grounds are on the open seas. Consider the silvery, long-tailed Arctic Terns, hovering lightly over tundra pools. They are not nearly as delicate as they appear. For much of the year they live the life of true seabirds, far out over the ocean. During the past nine months they may have traveled some 25,000 miles, to the edge of Antarctica and back, out of sight of land for weeks at a time, somehow finding their way back to this spot for the brief Arctic summer. In their ocean travels, Arctic Terns will have crossed paths with Long-tailed Jaegers out at sea, and during the summer the jaegers are here as well. These piratic seabirds come coursing low over the tundra, graceful and swift, their long streamers of central tail feathers waving up and down with each wingbeat. There are actually three kinds of jaegers here, and the largest, the Pomarine Jaegers, are among the major predators of the region. In most summers the Pomarines are not common, which is just as well for the smaller birds on which they often prey. But in big lemming years—summers in which these little brown rodents are at a population high—the Pomarine Jaegers move in and become lemming specialists, competing with the resident Snowy Owls. No matter how much the oil companies try to minimize the effects of their operations, large areas will be destroyed or degraded. ​Ah, yes, the Snowy Owls. 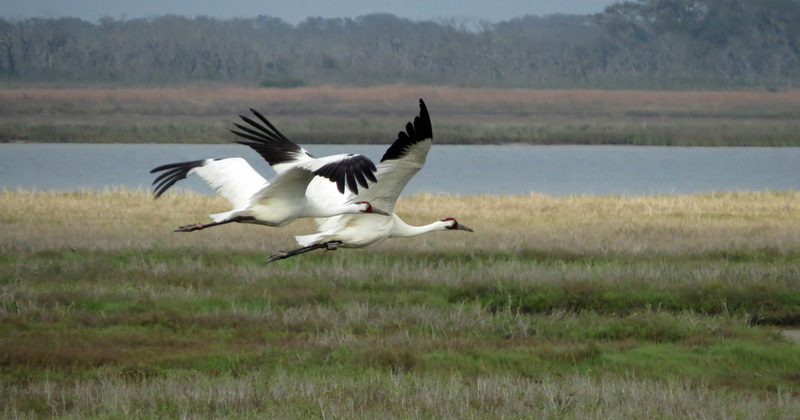 These magnificent, powerful birds, white with glaring yellow eyes, are perfectly at home out on the coastal plain. Some may even stay through the harsh winter. If they do, in spring they will get to watch one of the most remarkable transformations in the world, as the deep freeze and darkness of winter give way to an explosion of life. The summer is brief, but with constant daylight the grasses, mosses, and wildflowers grow. Butterflies skim low over the tundra along with myriad other tiny insects, lemmings scamper about, and birds make feverish haste in raising their young before autumn sets in. A year’s worth of living is crowded into a few weeks, and the skies ring with the cries of birds that have traveled thousands of miles to be here. If oil drilling comes into this magical place, of course it will have an impact. No matter how much the oil companies try to minimize the effects of their operations, large areas will be destroyed or degraded. And the birds that lived on those areas cannot just move to another spot. It simply doesn’t work that way. The land has only a certain carrying capacity, and the good spots are already taken. Destroy a bird’s habitat and the bird is dead, for all practical purposes, just as if you had shot it. These are sobering things to consider as we stand on this tundra ridge, deep in the wonderland of the Arctic coastal plain. The golden-plover is up there again, flying wide circles in the sky, sending forth that haunting whistle that rings with wilderness and freedom and vast distances. Sad to think that it might come back here next year, after braving another long migration, to find that its own special place on the tundra has been taken away forever. If we’re going to drill in the Arctic refuge, we should not do it under the pretense that “it’s all worthless tundra” or that “there’s nothing there.” We should go into it with the full knowledge of what we will be destroying. The recent takeover of Oregon’s Malheur National Wildlife Refuge by the Bundy militia was such an unusual event that it spotlighted some gaps in understanding among the American public. Some of the confusion was enhanced by media hacks, uncritically repeating the militia’s claims—for example, the idea that their grab at freebies somehow had a constitutional basis. But the most surprising revelation for me was that so many Americans seemed unaware of the existence of National Wildlife Refuges. ​News coverage of the Malheur situation ended rapidly after the last of the occupiers surrendered to law enforcement on February 11. But although the occupation is over, the threat to Malheur—and to other refuges and other public lands—is still very much alive. It’s important for the public to know more about the National Wildlife Refuges and their value to the American people. Early in the occupation, national news outlets referred to Malheur as a “federal bird sanctuary in Oregon,” as if it were a quaint and unexpected place for the feds to keep their birds. But in fact the National Wildlife Refuges are not just bird sanctuaries, and they’re not just tucked away in western landscapes. Administered by the U.S. Fish & Wildlife Service, the National Wildlife Refuge System includes more than 560 separate units. Twelve National Wildlife Refuges are located within 100 miles of New York City; ten are within 100 miles of Washington, DC. Others are very close to Miami, San Francisco, Houston, Seattle, Philadelphia, and most other major cities, while still others are as remote as isolated atolls southwest of Hawaii. National Wildlife Refuges are all over the U.S., yet many Americans barely realize that they exist. ​As a result, an uninformed public may simply lump these refuges with other lands managed by the government. All public lands have value, but they’re not all the same. Different types of public lands should be considered on their own merits. ​My own personal viewpoint is affected by the fact that I’ve been a birder all my life. I heard about National Wildlife Refuges when I was nine or ten, made my first visit to one at the age of eleven, and have spent hundreds of days on refuges since then. ​Birders like me tend to be keenly aware of National Wildlife Refuges (NWRs), because most of us have had spectacular experiences there. 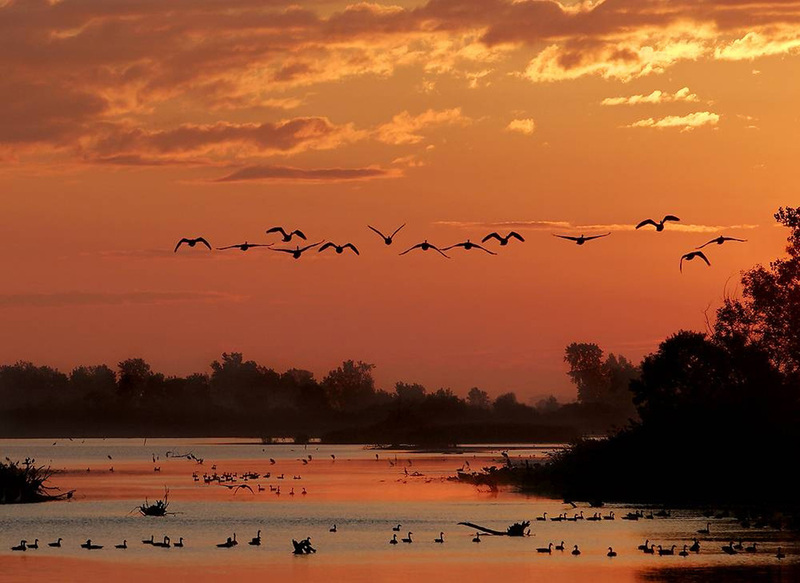 Whooping cranes at Aransas NWR (Texas), snowy owls at Parker River NWR (Massachusetts), eagles at Ottawa NWR (Ohio), clouds of geese at Bosque del Apache NWR (New Mexico)—these and myriad other memories make us avid fans of the NWR system. Even so, most refuge visitors are not serious birders. Instead, they’re just members of the public, enjoying the outdoors and watching wildlife. National Wildlife Refuges bring benefits beyond the enjoyment and education of visitors: they also provide huge boosts for local economies. People traveling to visit NWRs spend money at hotels, restaurants, gas stations, stores, and other businesses. Malheur NWR itself provides a good example: a recent study showed that visitors to the refuge from outside the region spent more than 13 million dollars per year in Harney County. If the refuge were closed down or turned over to local ranchers, as the militia suggested, that would lead to a catastrophic loss of income for nearby communities. ​Why are the NWRs so outstanding for birds and wildlife? Location helps, but in addition, most are intensively managed to support native species. This management, all based on scientific principles, may include careful control of water levels, regulated amounts of grazing, occasional controlled burns, thinning of woodlots, and intensive control of invasive, non-native species of plants and animals. Control of invasive species is particularly important, because these can degrade habitat and drive out native species. At Malheur the most problematic invasive is a fish, the common carp, accidentally set loose in local waters decades ago. Without active control measures, the carp would multiply enough to destroy the marshes throughout the refuge. A biologist on the staff had been working for several years on science-based approaches to reducing carp numbers for the benefit of all native wildlife at Malheur. Given the limited awareness displayed by the militia, it’s no surprise that they didn’t try to understand things like science or habitat management. They weren’t from the local area so they wouldn’t have known, or cared, about the effects of invasive carp on priceless habitat. Probably they wouldn’t have cared that towns in Harney County benefit from the proximity of Malheur NWR. The militia seemingly had no intention of helping the local community; they were pushing their own agenda. In fact, the militia’s whole approach demonstrated a basic lack of comprehension. They arrived with the ostensible purpose of supporting two local ranchers. These ranchers had had run-ins with a U.S. government agency, the Bureau of Land Management (BLM). But the militia responded, not by attacking the BLM, but by taking over a facility of the U.S. Fish & Wildlife Service. Perhaps, in their ignorance, they couldn’t tell the difference. ​​It was as if a gang of armed illiterates took over a public library and began burning books—to protest the actions of the local water company. It makes no sense. And we shouldn’t expect their effort to make sense. While the Bundys might imagine themselves to be leaders in this movement, they’re not. Powerful, wealthy corporations and individuals are working behind the scenes to get their hands on public lands, and they’ll use any pretense to get communities in the west riled up against the federal government. For them, people like the Bundys are useful tools, expendable pawns who can make headlines and then go to jail. If these powerful interests get their way and take vast swaths of land away from the American public, small-time ranchers and small communities won’t gain anything—the profits will flow to those already at the top. But the occupiers at Malheur had no real concept of where their actions might lead. Some PR flacks in the media portrayed militia members as rugged individualists, as if that role required no more than a cowboy hat and stubble beard. But the Bundy kids are no more independent than their dad, welfare cowboy Cliven Bundy, who let his herds run wild on public land and refused to pay even the artificially-low government grazing fees. No, if you’re looking for a rugged individualist, let me recommend Theodore Roosevelt. He was an explorer, a rancher, a military hero with the “Rough Riders,” and U.S. President from 1901 to 1909. As president, Roosevelt was responsible for establishing national forests, national monuments, national parks, and the first National Wildlife Refuges—including Malheur NWR in 1908. ​Theodore Roosevelt was a genuine American patriot who understood the value of public lands. The forces trying to undo Roosevelt’s work don’t deserve our respect or attention. Presumably the Bundy ringleaders will be in prison for a while, but shadowy billionaires and misguided politicians are still quietly working to dismantle our legacy of public lands. Members of the birding community—and others who care about the natural world—will have to do a much better job of speaking out, standing up, and defending the National Wildlife Refuges if we’re going to keep them. Support Malheur and America’s Wildlife Refuges: Buy a Duck Stamp!